That new found passion is jewellery making. During my stay in Dubai and while I was working with SNF (a school for the specially abled) I was lucky to have been in the company of my colleague the so very creative and talented Raquel who has been such an inspiration in my life and I got to learn the starting of Jewellery making and craft work from her. As I create every piece I still am thankful to her. When we are so far away from family and friends at times the loneliness gets a bit too much and just to keep myself sane and be a little independent I started off with creating these pieces and thought they looked quite beautiful. I still seem surprised when I complete some of the pieces and I tell myself 'did I really create that'? Most of the photography is done by my 10 year of daughter Diya. From encouragement from my friends I started getting orders and so that's how I stated off!! I have these bracelets available at AUD $8. Handcrafted with love just for ‘YOU’!! I have this fascination for blue and you may find it in most of my creations ;) This is a simple blue beaded bracelet. 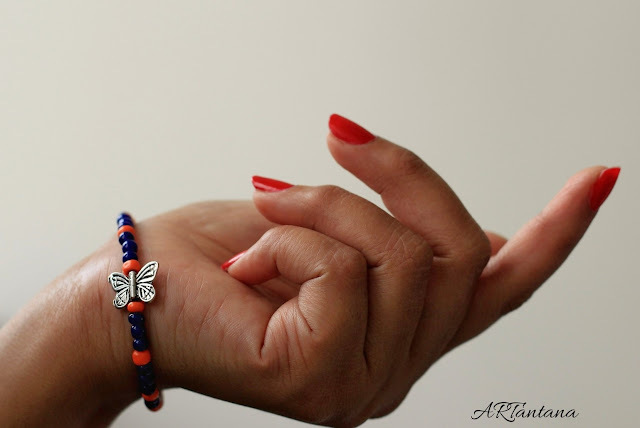 This fairy wing beaded bracelet is my favourite!! I have really started to enjoy chia seeds filled with goodness!! They are an excellent source of Omega-3 fatty acids, which help to raise HDL(the "good" cholesterol that protects against heart attack and stroke) cholesterol. Chia seeds also are rich in antioxidants, and they provide fibre, iron and calcium. The night before place in different jars the chia seeds in about 100 ml of milk along with 1tbsp and oats in the remaining milk with another 1tbsp of honey. Mix well to combine. Leave it in the refrigerator (it's pretty cold here in Sydney so I just left it outside) overnight to thicken. In the morning I just layered it up starting with the oats at the bottom and alternating it with chia seeds in a jar or glass. Since my little one is very fond of rose syrup I decided to add two tbsp. into the chia seed layer for her. Added some freshly sliced strawberries and it was ready in no time and the best part is with no effort!! Hope you will enjoy this breakfast as much as I do. Thanks for dropping by and have a great day ahead. Cheers!! We haven’t been able to find any tea coasters that we really liked for our new home.With the kids home during the Easter break we decided to try making some instead. So we landed up making these colourful popsicle tea coasters(this was my elder one's idea). ones).Place them together and run a scotch tape around the centre on both sides to keep them in place(but for people like me I prefer to do without it). Use the jute string to interweave plain white coloured the popsticks. It should be tight enough to keep the popstickss in place . As you reach the last Popstick interweave it backwards the same way. We did three complete lines at a time. We finished it off by knotting the thread at the end. It's really very easy and you may want to try it out :) Cheers!! It’s been quite a while since I have been away from bloggerland…a little busy with our relocation (btw we have relocated from Dubai to Sydney) and still trying to settle down. Feeling blessed with the change as we are now closer to greenery and nature after the desert sands for so many years. Kids are settling down fine and are happy with their school and it has been an awesome Easter break …with trekking to some of the most beautiful mountains around New South Wales . Dedicating this post to my fish lover friend!! I just fried the salmon in oyster sauce. I used the wholemeal wraps and spread the Mayonnaise(but the kids find it a little to spicy so I just spread in half the wrap to reduce the spiciness and as usual Diya tells me " you are a crazy mom") and filled up the wrap with vegetables(since the kids don't really like them when they see them...so a wrap conceals the amount you stuff :) Placed the salmon on top and added the mustard and BBQ sauce. Then folding the wrap bottom up and on both sides and it was ready to be eaten!! And Diya settles down with her favourite book and says "this is heaven"!! What better compliment can I receive? Hope to see you soon again. Have a great day!! Cheers! !